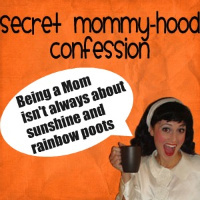 I really like that Kim does Secret Mommy-hood Confessions Saturdays. I helps me vent out things that have been weighing on me all week. I know that is not a juicy one. In fact, now you’re bored and will probably just move on, and that’s ok. But I’m going to plunge ahead anyway, Ok? This week totally exhausted me. So much so that after getting out of bed this morning at 10:00 (thank you, Cort! ), I played with Eddie for an hour and then passed out on the couch for THREE HOURS. This week was hard on me even though it really wasn’t a bad week. Ever have one of those? I am tired of picking up after teenagers. I am tired of students leaving things behind and then freaking out WEEKS later. I am tired of having to say, “get back to work,” “let’s focus,” “talk while you work…WHILE you work,” among other things. I am tired of giving a thousand chances to maybe get a D- instead of an F.
I”m tired of having to hound 18 year olds about graduation requirements. I”m tired of doing more for less. I also learned some exhausting lessons this week. students never hear you the first time (this should not be knew, but in light of the week, it was frustrating). adults can act every bit as immature as a 14 year old can. adults can back stab you if they think it will get them in good with someone. not many people can keep a secret. massive week-long blog events that include a gazillion giveaways are incredibly rewarding…and exhausting. I need to toot my own horn when I want to be recognized for something I am proud of. Maybe others will pick up their horns for me too, but maybe not. So I have to play LOUD–for myself. It’s exhausting to be proud of yourself. Many positive things happened to me this week–mostly in the blogging world–and keeping up with them left my head spinning. But I will end this tired ramble with the things I am proud of, that I hope you will take the time to check out. That’s right! I am on BlogHer with my post My Mother’s Hands. Because of tons of encouragement from this lady, this lady, and of course this lady, AND with Cort rooting me on, I shoved all my fear of rejection down and submitted five of my babies posts to BlogHer. Knowing the talent that they usually pick up, I really wasn’t expecting to hear back (I know, I know…lame of me), but when that email landed in my inbox? I FREAKED OUT! Cort was gone to class and I just scooped Eddie up and danced and cried with him. He thought his momma had finally lost it. So anyway, please go read my post over there…and leave me some love and sparkles if you like it. That’s right, the sweet and talented Natalie has taken notice of me lately (which makes me blush), and has featured me two weeks in a ROW on her Monster Likes weekend round up of her fave posts. This week my writing tips made the cut. Go check out who else she likes this week (always good reads, by the way). I am all sorts of honored and still blown away that Nichole and Cheryl–two writers I hugely look up to–would even consider me to be part of their team, let alone ask me! To me, this is exactly the thing that has been missing from my writing life. It pushes me to read more, contact other writers, and think outside of my own writing box. I love it. this is where I do my creative writing. Right now there is a piece of fiction I just posted–and I almost never write fiction–that I feel pretty good about. I’d love for you to give it a read and tell me what you think. It’s called White Agony. I haven’t posted here in a while since I am in the middle of reading books…as are many of my contributors. If you have read a book that you would like to submit a review for, contact me, and we will set something up! Lastly, if you haven’t entered all of mine and Miranda’s giveaways? You can find a list of all the links here. More than one person asked me this week asked how I do it all. Even my therapist wanted to know. And I just shake my head. I don’t know. I really don’t. I all I can say is, if you really, REALLY love something, you will do it. If something brings joy to you in spite of the challenges it causes, you will do it. Or at least I will. But? It will still tire me out. what goes at the beginning of a sentence? what goes at the end of a sentence? why did you pull so and so’s trousers down (!)? I coudl go on and on and on!!! Focus on the positives! Your post my mother’s hands is simply beautiful and inspired me to write my baby’s feet. You are a talented writer and I am going over to blogher now to big up your post!! Wow, you have an amazing list of accomplishments in one short week. I have so enjoyed the Red Dress Club this week and now need to take a bit of time to catch up on reading all of your great writing which seems to be everywhere this week. Congratulations on everything, your hard work is definitely paying off! Great job, girl! You deserve it. Hi there, and thanks again for stopping over to visit my blog. From the looks of things on your blog, you sound like a very busy woman! I will be checking out your Blogher submissions as well. Way to go! Yup…those weeks blow but look at all the good that came out of it. So proud of you and your accomplishments this week. You rock mah socks. Could I just have half of your energy? You my friend, are doing it all and doing it WELL. Congrats on the BlogHer syndication! 🙂 That is fantastic! Congrats to you! How did you submit your pieces to BlogHer? I’ve been thinking about doing it, but not sure where to start.